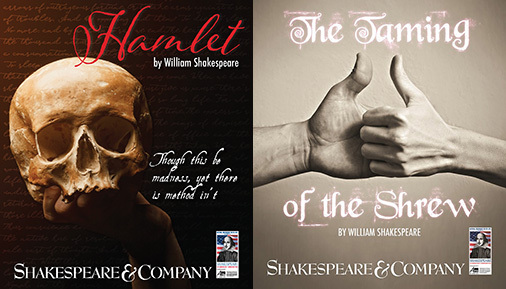 The Lenox, MA-based Shakespeare & Company brings two of The Bard’s classic plays to the Maureen Stapleton Theatre on the Troy campus. The 90-minute productions are part of the company’s educational touring program and are suitable for ages 10 and up. “Hamlet” will be performed from noon to 1:30 p.m. Tuesday, Feb. 19, followed by “The Taming of the Shrew” from noon to 1:30 p.m. on Thursday, Feb. 21. All are welcome to attend and admission is free. “Hamlet” is set in the aftermath of the king’s death, as Denmark’s royal court celebrates the marriage of his brother to the widowed queen. When the king’s ghost appears to his grieving son, Prince Hamlet, and reveals the shocking circumstances of his demise, Hamlet embarks on a course of action that will change everyone’s lives forever. In the provocative comedy, “The Taming of the Shrew,” the smart, independent and somewhat mad Kate plans to remain unattached, leading to a battle of wills with the bachelor seeking to marry her younger, more amenable sister. Both plays test long-held beliefs about love, duty, friendship, power, identity and wealth. These performances mark the 10th year of Shakespeare & Company’s week-long residency when a series of acting and theater arts workshops are offered to all students, faculty and staff. The residency traditionally includes a free performance for the public during the Winter Break observed by most public school districts.